Can you tell me more about the Graduate Program in Statistics? To learn more about the MS graduate program in Statistics please go to this web page. To learn more about the PhD graduate program in Statistics please go to this web page. Can you tell me more about the Graduate Program in Actuarial Science? To learn more about the graduate program in Actuarial Science please go to this web page. Could you please send me application materials? We do not send materials by postal mail, since all of the needed information and required forms are available on this web page. What are the application deadlines? Decisions for Graduate Financial Support are typically made by April 15 for the upcoming academic year, so applications from students requesting financial support should reach us by February 1, 2019. Academic Requirements: (Statistics) Students who apply to our M.S. program should have 3 semesters of calculus, a semester of linear algebra, at least one (preferably two) semesters of mathematical statistics (i.e. statistics with a calculus prerequisite), a semester of applied statistics or linear regression analysis, and a semester of computer programming. For students who know that they eventually want a Ph.D., it is advisable, though not strictly required, that they have a semester of real analysis. Academic Requirements: (Actuarial Science) Students who apply to our M.S. program should have 3 semesters of calculus, a semester of linear algebra, at least one (preferably two) semesters of mathematical statistics (i.e. statistics with a calculus prerequisite), For students who know that they eventually want a Ph.D., it is advisable, to state this in your personal statement. PLEASE NOTE: All applicants are considered for financial support and Graduate Assistantships include: Teaching Assistsnts (TA); Research Assistants (RA) and Graders. No additional form is necessary. So if you are interested in financial support the APPLICATION MUST BE COMPLETE on February 1, 2019 AND INCLUDE 3 LETTERS OF RECOMMENDATION; STATEMENT OF PURPOSE; GRE Scores (can be unofficial); TRANSCRIPTS FROM ALL PREVIOUS EDUCATIONAL Colleges and Universities (can be unofficial) and TOEFL (if an International student). May I apply to begin the program in the Spring or Summer semester? We strongly discourage applications to begin the program in the Spring rarely do we admit students who submit applications. The reasons are that (1) courses that are offered only in the Fall semester are often prerequisites for Spring semester courses; (2) funding is rarely available in the Spring for new students; and (3) class space is limited in the Spring. What if I already have a masters may I apply directly to the PhD Program? Typically, students who wish to pursue a Ph.D. in Statistics will be admitted initially to the M.S. program. After passing the PhD Candidacy Review, the student will be formally admitted to the Ph.D. program. A U.S. bachelor's degree from a regionally accredited college or University, or an equivalent degree from another country as determined by the Office of Admissions. A minimum grade-point average (GPA) of 3.00, or foreign equivalent as determined by the Office of Admissions, on the completed undergraduate degree or on at least 12 hours of a graduate degree. The GRE is required; however, there is no set minimum GRE score. The subject test is not required. Your GRE scores must be reported directly from the testing agency. Those dated within the last five years are acceptable. The University of Iowa institution code is 6681 (you do not need department codes). Please not our department does not accept GMAT scores. We may request an interview (by telephone, Skype, or in person) prior to making an admission decision. Are there additional requirements for International Students? Yes, an International English Language Testing System (IELTS) total score of 7.0, with no sub score less than 6.0, may be used to satisfy the English-language requirement. All IELTS test takers will be required to take the on-campus English Proficiency Evaluation. A minimum TOEFL score of 105 is required on the internet-based test if you are applying for an MS or PhD in Statistics; the minimum TOEFL score of 85 is required on the internet-based test if you are applying for the MS in Actuarial Science. Your TOEFL scores must be reported directly from the testing agency. Those dated within the last two years are acceptable. The University of Iowa's institutional code is 6681 (you do not need departmental codes). Students whose TOEFL scores are below 600 (250 on the computer-based test; 100 on the internet-based test) will be required to sit for an English evaluation upon arrival in Iowa City. The Graduate College will require these students to take and pass recommended course work in English usage. This requirement is waived for applicants who have completed a bachelor's degree (or higher) at an accredited university in the United States, the United Kingdom, Canada (excluding French-speaking Quebec), English-speaking Africa, Australia, or New Zealand. Please note regarding TOEFL: This requirement is waived for applicants who have completed a bachelor's degree (or higher) at an accredited university in the United States, the United Kingdom, Canada (excluding French-speaking Quebec), English-speaking Africa, Australia, or New Zealand. On the official application it will state that TOEFL is required, HOWEVER, this is not waived until The University of Iowa has received notice of your degree (or degrees) which can happen much later (after you graduate). (So we just say DO NOT WORRY about it and that this will be waived at a later date). TOEFL scores in general are only valid for 2 years after the test date. So if you took the exam on April 2nd, 2015 the scores will only be valid until April 2nd, 2017, at which point ETS will not send out official scores for that particular test. As long as the official scores are sent from ETS prior to invalidating, we will accept them. Applicants from India with the 3 year bachelor's degree must complete at least the first year of a master's program from an institution recognized by the Association of Indian Universities in order to meet our minimum eligibility requirement of a 4 year U.S. undergraduate degree equivalent. How many students apply each year? How many are admitted? Application volumes can vary substantially from year-to-year. For 2019-19 we received about 199 Statistics and 57 Actuarial Science applications. Incoming cohorts are generally 8-15 students in each program. The number of students admitted usually depends on the availability of funding to support the students. What proportion of admitted students receives funding? Currently, two-thirds of the students admitted to our program have some form of funding. Most receive teaching or research assistantships. Some have external (i.e., non-University of Iowa) funding. A very small number of students receive fellowships from the University of Iowa's Graduate College. Research assistantships are primarily reserved for our PhD candidates. Funding is very competitive, many very well qualified and deserving students will not be granted support. Our needs are greater for students who have a background in Statistics. If I am an international student and offered a graduate teaching assistant, what do I need to do to get my English language skills tested? All students for whom English is not a first language and who have first-time appointments as graduate teaching assistants (TAs) are required to take a test to assess their effectiveness in speaking English before they are assigned assistantship responsibilities. The English Speaking Proficiency Assessment (ESPA) is a test that assesses students' oral language and listening skills. To take the test, students must be enrolled in a graduate program at The University of Iowa, and an academic department must be considering hiring them as teaching assistants. Details will be given to all students. All students to be tested must first register for the ESPA test through their departments. When a department offers (or is thinking about offering) a teaching assistantship to a student who has never before been a TA at the University, the department sends a Request for Evaluation form to the ESL Programs Office. The ESL Office sends the student (via the department) a letter indicating the time and place of the appropriate ESPA testing. What is the difference between a fellowship and a teaching or research assistantship? A fellowship generally includes a 12-month stipend and a full tuition scholarship, renewable for four or five years (provided that the student is making adequate progress in the program). Usually, the first and last year of a fellowship are free from assisting faculty with research and teaching (while the middle years require that the student work with faculty on assignments related to teaching or research). In contrast, teaching and research assistantships are generally 9-month appointments, carrying a stipend and full tuition scholarship. Students who receive teaching or research assistantships are expected to work an average of 10 (if 1/4 -time) or 20 (if 1/2-time) hours per week on assignments related to teaching or research. Is funding available for students who are not U.S. citizens? Yes. Students who are not U.S. citizens are eligible for teaching assistantships, and in most cases, research assistantships. Note, however, that students who receive teaching assistantships must be certified by the English as a Second Language Program. What are the minimum GRE scores for each area? We do not have a required minimum for the GRE scores. Of the 300 students who applied to our program for the 2018-19 academic year they had an average GRE: 151 Verbal, 167 Quantitative score. We read the entire application file. Consequently, what a student may perceive as a deficiency in one component of the application (say, a low quantitative GRE score) can be compensated with exceptional strengths in others (say high grades in quantitative college courses like mathematics that are reflected on a transcript). If a student feels that her/his GRE scores do not accurately reflect her/his ability, then it is a good idea for the student to explain that in their statement of purpose (pointing to other evidence of their ability in other application materials). How recent must my GRE scores be? Your GRE scores are no longer valid after five years. Thus, if your scores are five years or older, you must re-take the GRE. Will you accept the initial report on my GRE that I received after taking it? No. We must have an official report sent to us by ETS (the organization that administers the GRE). We must have the official report by the application deadline to ensure that your application receives full consideration. How many times may I take the GRE? You may take the GRE as many times as you would like. We will consider all of your scores as an aggregate. That is, we will examine the range, the median, and the trends in the scores. Note that taking the GRE multiple times and scoring higher on one attempt than others does not necessarily mean that we will consider only that highest attempt. 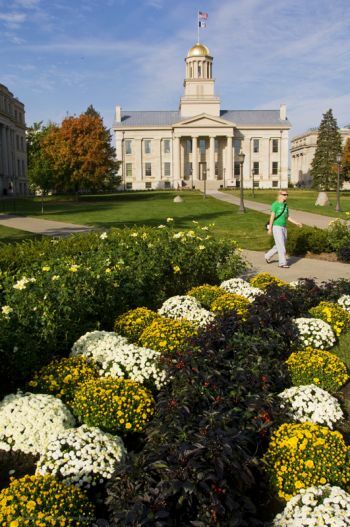 What is the estimated cost for international students to attend the University of Iowa? The estimated costs can be better reviewed on this website. In 2018-19, a 1/4 time appointment (10 hours of teaching or grading) receives a full-tuition scholarship and $9818 stipend for the school year. A 1/2 time appointment (20 hours of teaching or grading) receives a full-tuition scholarship and $19636 stipend for the school year. Students holding an assistantship (quarter-time or more) are classified as residents for fee purposes for the terms during which their appointments are held and any adjacent Summer Sessions in which they are enrolled. They are not assessed a technology fee, but will be responsible for miscellaneous fees assessed each semester (student health, student activities fee, building fee, student union fee, arts and cultural fees, recreation fee, etc., which total $463 per semester). What is the admission and completion data for Statistics PhD Program? More information can be found on the Graduate College website. Do you accept letters of recommendation online? Yes, we do. You just need to enter your recommendor email address and Admissions will send a request on your behalf. Who should I contact with specific questions? Please contact us by e-mail at statistics@uiowa.edu or by telephone at 319 335-2082, ask to speak to Margie.